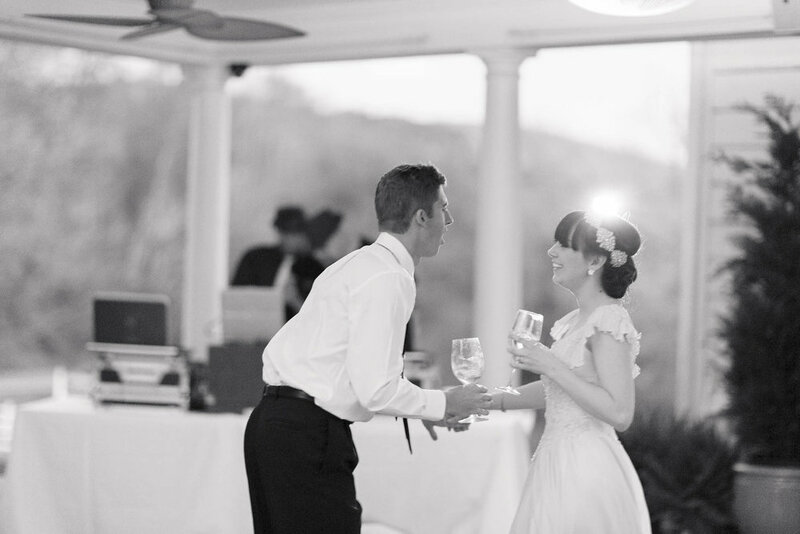 We had the best time at our wedding reception, even if it felt like it only lasted about fifteen minutes. The wedding party was announced to "Soul Meets Body" by Death Cab for Cutie, and then the song changed to "Such Great Heights" by the Postal Service when Rob and I were introduced. We immediately went into our first dance, which was to about two minutes of Explosions in the Sky's "Your Hand in Mine," which has always been our song. Then the cocktail reception went on for a bit more before dinner, which was followed by more drinks, dancing, cake, and a bouquet toss before we had a sparkler exit! I am just now realizing that I never shared the name of our venue--it's The Plantation on Sunnybrook in Roanoke, Virginia and it was just so beautiful. Our ceremony was in a gorgeous boxwood garden, they have a covered patio with a little waterfall that's perfect for a cocktail reception, and the dining room is just lovely. There were passed hors d'oeuvres (fancy little shrimp cocktails and an awesome buffalo chicken bite in a crispy wonton cup, topped with blue cheese crumbles) and champagne for the cocktail reception, and for dinner we had a buffet with Chicken Roulade, summer vegetables, bacon-wrapped green bean bundles, a salad bar, and a roast beef carving station. The food was great. We served wine, beer, vodka, and bourbon; with an Old Fashioned, Rosemary Pear Martini, and Cucumber Mint Cooler as signature cocktails. I was really excited to include a chardonnay from La Crema, which is one of my favorite wines, and my new brother-in-law Dan made four beers for us! Those details with the signature drinks made the bar feel really fun and personalized. I made a menu board and seating card holder out of an old window and shutter, respectively. You can see how I made the menu board on La Crema's blog right here (I included the seating card holder below but blurred out some of our guests' names). It was so easy to make these two things, and I thought they looked so pretty! My dad and I danced to his favorite version of "Somewhere Over the Rainbow." He used to sing that song to me when I was a little girl, so it's always been special to the both of us. Rob danced with his mom to "What a Wonderful World." Tina, my wonderful Maid of Honor, and Sam, Rob's brother and Best Man, gave wonderful little speeches that made me laugh and cry. Then we cut the cake (which was made by Priceless Cups & Cakes) to "Sugar Sugar" by The Archies (no cake was smashed into anyone's face, although we did pretty much destroy the thing while trying to take a slice out). We had two flavors--chocolate cake with an Oreo filling (Rob's choice) and white cake with peach filling (my choice)--and the whole thing was delicious, even if I only got a bite. 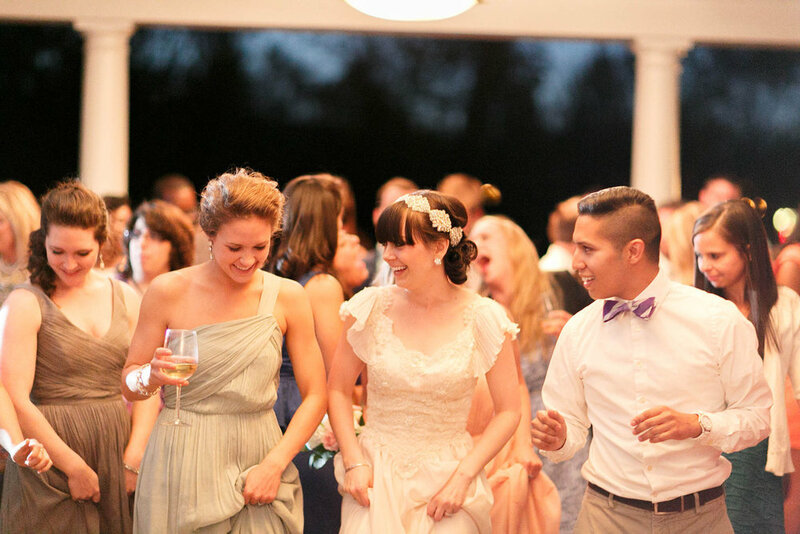 I tossed the bouquet to "Milkshake" by Kelis, and my friends Shawna and Tony both really went for it. I'm actually not sure who ended up getting it, but they both deserve an A+ for effort. And everyone danced, a lot. It was fantastic. I know everyone always says "Oh gosh, our wedding was the best night of our lives!" and I always thought, okay whatever but yeah, our wedding was the best night of our lives. Thank you for letting me share it with you now! Next up I have some more couple shots and then I think I'll be done with wedding recaps. This post is sponsored by La Crema. As always, I thank you for your support while I continue to work with brands.